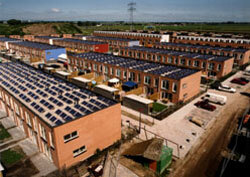 Summary Residential PV project with 125 row houses with 20 and 23 m2 PV each: in total 2462 m2 PV-module area. The PV panels are mounted on the flat roofs on plastic stands and due to a small brick wall: out-of-sight. The orientation of the PV panels is south to SSW, while the modules are tilted 25 degrees.